Well I finally made my first Jelly Roll Race quilt, took long enough right as this pattern has been so popular for a long time! Last spring when I was at the quilt show in Winnipeg I bought a Gelato Ombre jelly roll from Keystone Quilts. She had a Jelly Roll race quilt made from it hanging in her booth and I just fell in love with it! So in September when I was at a Keystone retreat in Winnipeg I made the quilt top. 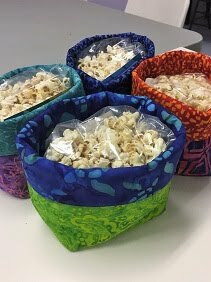 It was a great retreat project and I even put all the strips into a bag and randomly pulled out a strip and sewed them end to end. Those that know me well know that would not have been an easy process for me as I like to be ‘matchy matchy’ when I put fabrics together. The only time I put a fabric strip back in the bag was if I had just pulled that same one out that I just used as there are doubles of each fabric in this jelly roll. 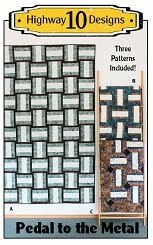 I chose Ebb and Flow for the pantograph, Monopoly thread and Quilters Dream Blend batting. Still need to add the binding but this might be the last sunny day for awhile! I was able to get some nice pictures down at the boat launch dock on the river in Emo. It was windy but I take risks with my own quilts ( NOT with my clients) as I had my foot on it for most of the photos except this next one! So glad it didn’t blow into the river! I had drove down to the Barwick boat launch with the lighthouse but the dock has been pulled out for the winter. Vicki brought me a few quilts and I two ready to share. The first one is a Four Patch quilt in lovely modern floral fabrics. She thought swirls would nice for quilting on it so I picked Fascination as it fit the scale of the large blocks. I used apple green So Fine thread and Quilters Dream Blend batting. This is Vicki’s second quilt called Road Trip and since it is for a boy I used Popcorn for the panto. Beige So Fine thread and Quilters Dream blend batting. So the weather has finally improved here, nice sunny skies but the wind has been crazy. We actually had a few shingles blow off our roof so Tim was up there today putting them back on! So that means I had to come up with a new plan for quilt photos since I can’t get any outdoor pictures. At Christmas last year Tim bought me a backdrop stands and I found that the round bar that it came with was not the best for hanging quilts on. So this weekend Tim created holders to add to the stands so I could use a 1x2 board to clamp the quilts to and also have it extend out so the legs on the stand could be hidden. Works great! I can hang any size quilt and hide the stand behind it. Only down side is moving furniture in the living room to set it up as that room has the best natural light and then I have to take it down. I also found these great skinny clamps at Menards that work perfect! This is Diane’s beautiful batik Gemstone quilt! 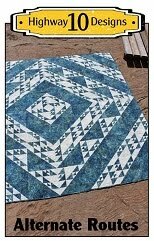 It was a BOM project from Up North Quilt Shop in 2016 and the pattern is by Wing and a Prayer. It is a large quilt, 92” x 106” and I love how it looks on my bed! 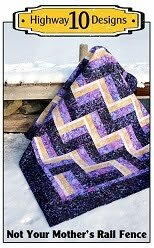 I quilted it with the Taro pantograph, used violet So Fine thread and Quilters Dream Blend batting. Its been a very rainy and cold fall in NW Ontario so not getting many opportunities to take outdoor pictures. We have two new Highway 10 Design patterns that are waiting to be printed as we still need a cover shot for one! Fingers cross we get some sunny shine and no wind later this week so I can get those photos done! This is Hollie’s Under A Spell Halloween wall hanging. 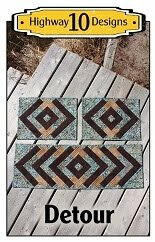 The panels and pattern are by Jennifer Pugh and I found a website that still sold them, click here. She said I could quilt it however I thought it should be quilted. I knew right away the small panels should be quilted with spiderwebs. Love quilting spiderwebs! Then the larger center panel I thought about cross hatching and changed that idea a bit to wavy cross hatching to look more like chicken wire. Then I added large swirls to the outer border. Hollie added a orange flange around the center panel and the outer edge which really pops! I used beige MicroQuilter thread and Quilters Dream Blend batting. Lots of fun Halloween fabrics on this quilt! 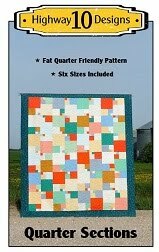 This is Mary Jo’s Quiltmaker’s Garden quilt and you can find the pattern for sale here at The Quilting Company. Mary Jo asked for custom quilting and I had fun adding a light custom touch to her quilt. I used a light beige MicroQuilter 100wt thread and Quilters Dream Blend batting. Its been raining a lot here so had to get out my photography stand to get a nice full shot of the quilt. I used a stencil on the watering can to add a fun detail.